Image: Marvel Comics. Art by Alex Ross. The recent Clone Conspiracy event has brought back a few dead people from Spider-Man’s past. Some good, some... well, less good. One of those folks is none other than Otto Octavius—he’s back, better than ever before, and he’s got some new supervillainous friends to boot. 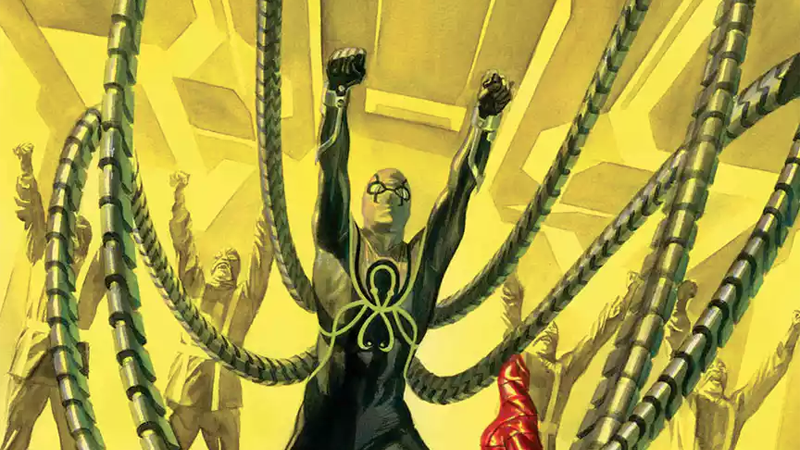 Marvel has just unveiled its June solicitations, and naturally, the upcoming reveal of Steve Rogers’ fealty to Hydra in Secret Empire plays a big part in them. There’s tons of spinoff books like Brave New World and Uprising, but the event will also bleed into other ongoing series, like Amazing Spider-Man #29, which will see Otto reveal that he’s joined Steve’s Hydra invasion, and he’s ready to take Peter Parker down again as the Superior Octopus. Fancy duds you got there, Doc. Very Spider-Man, which is appropriate give the fact he was Spider-Man for a bit. This is the culmination of what’s been a long road for Octavius, ever since his “death” in 2012, which ultimately lead to him body-swapping with Peter Parker and inhabiting the webslinger’s body as the Superior Spider-Man. And thus, being comics, neither Peter nor Otto were gone for good—when Pete got his body back, Otto lived on, hiding in the body of the Living Brain as Peter’s docile robot assistant. That remained until the recent Clone Conspiracy event brought him back into a cloned version of his old body, and then later in its climax, gave him a new, younger “perfect” clone body that the reborn Ben Reilly had planned to use for himself. It’s... a long story. But now, Otto is back in his preferred Octopus form, and he’s got quite a bit of beef to settle with Spider-Man. Amazing Spider-Man #29 is set to hit shelves in June.